Arrival at Pisa on Saturday 13th July and returning Sunday 21st July. Daily breakfast on the balcony in La Fagiana. Group warm up outside on the balcony. Flute Ensembles taken by Sarah, Elizabeth and Philippa (Alto and Bass flutes provided). Supper in local restaurants in or within the vicinity of Tereglio followed by evening activities including concerts/film evening. 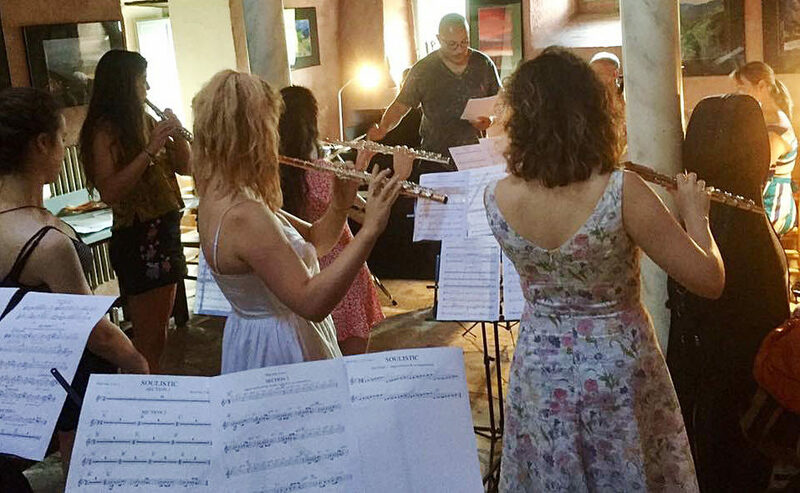 Saturday 20th July is devoted to rehearsals for the final concert in the large Church of Saint Maria Assunta, in Tereglio. Wednesday 17th July – DAY OFF. For a small additional cost, there is an organised trip to Lucca to see an array of historical sites. The mediaeval walls surround the city and an option to hire bikes, visit the Duomo di San Martino, the Roman amphitheatre, the numerous ice-cream shops and restaurants will all be available. Alternatively, participants may choose to rest for the day in Tereglio, or take a walk in the hills.